An abridged history of Burgundie. [ALL PREVIOUS HISTORY IN DISCUSSION BOX UNTIL I IRON OUT THE KINKS (ie. EX-NATIONS)] Burgundie, in its modern form, was founded as a series of Latinic trading posts in northern Levantia in the first century CE. Throughout history, it remained linguistically and religiously connected to Latinic roots, especially as the nations of Heku and Urcea formalized, but its social and economic culture is heavily influenced by the Gaelic and Germanic cultures it displaced and subsumed. The Isle of Burgundie remained the majority of the nation from its formation circa 853 until its explosive colonization of South Punth and southern Crona starting in the 16th century. During its war of independence, Burgundie also came to encompass the Kingdom of Ultmar, the predominantly Gaelic lands between the Feradach Sound and the nations of Kistan and Kuhlfros. The Levzeish peoples were ancient Levantine culture who established non-centralized settlements all across Levantia. They were estimated to have arrived in Ipar in the 6th century BC. They gave Ipar its ancient name, meaning "north" in Levzeish. The Levzeish lived much more permanently then the Impaxi semi-nomadic lifestyle and they created ancient port cities on the eastern and northern coast of Ipar. The largest settlement was Biscainhos, close to the modern capital of Vilauristre. Disparate emporium and Latinic ports along the coast of northern Levantia, the Coscivian and Kilikas Seas began to centralize around their shared culture. This is seen as the divergence of the Bergendii from the general pool of Odoneru Latinics. They formed a few small private armies and navies to further the goals of the Bergendii merchants in the area. They refused to see a single monolithic central government, but often came to each other's aid and involved themselves in each other's politics, especially around trade agreements. In the 130s an enterprising merchant, Julian Marcilius Corvus, formed an army in the naissant port of Nordarmus and marched inland to push the Impaxi tribes from the interior and ultimately on to Levantia. Over the next 20 years, his army was able to crush any opposition and then to push the Impaxi to the coast near Biscainhos. In 153 a joint Impaxi/Levzeish force crushed Corvus' forces. He escaped with only 75 men and his train. In 155 Corvus returned with a large navy and besieged Biscainhos, catching its navy in the harbor. After a three year siege and numerous heavy bombardments, the first sea-to-land naval bombardments in northern Levantine history, Corvus' forces forced the Impaxi/Levzeish population to surrender. 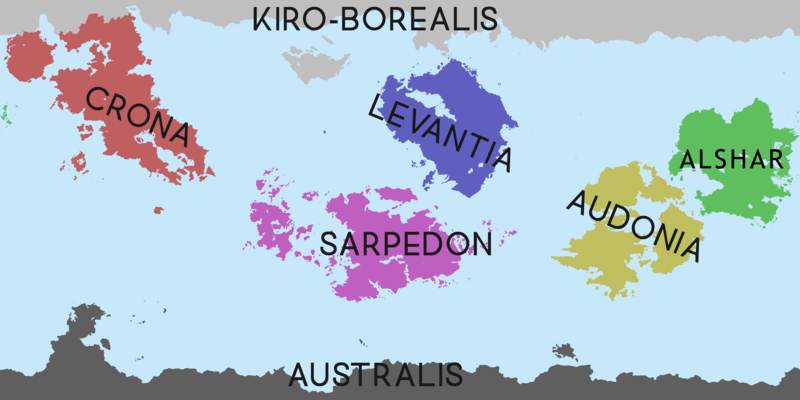 As part of the surrender agreement the Impaxi and Levzeish were banished from Ipar and resettled on the coast of northern Levantia. In 158, Julian Marcilius Corvus, now styled Bergendus, was crowned the first high-king of the Bergenddium. While often seen as the first formal state that would become Burgundie, the Bergenddium was a cultural empire rather than a legal kingdom. As such, the title of high king was more of an honor given to men of distinction than a royal appointment with set roles and responsibilities. The only task undertaken by all of the high kings, and often the reason that later high kings where chosen, was to negotiate peace deals with larger Kiro-Levantine powers. In 164, Julian Marcilius Corvus Bergendus commissioned a map of the Bergenddium which included all of the Isle of Burgundie, most of the coasts of modern Marialanus and settlements along the coasts of modern Kistan, Kirav, Meridia, Wintergen and some of the northern Kuhlfrosi islands. 937-1264 Upon the collapse of the Alvarus dynasty in 935 the clergy interceded as enforcers of public order. They drafted a militia and established courts, effectively taking control of the island. In 936, the bishop of Rabascall, a small coastal bishopric on mainland Levantia seized the opportunity to support the Archbishop of Bergendia with a militia drafted from his fief. He was able to quell the revolt in Vilauristre and the southeastern coast within a month but had orders to cease all activity as he was undermining the Archbishop's authority by being so successful. Rather than heed the order he marched to Vilauristre and seized the archdioceses buildings. Holding the Archbishop hostage, he demanded that the Pope intercede and name him the Archbishop of Bergendia as well as Rabascall. The letter never arrived at the Holy See, but at that point the Bishop of Rabascall had the Archbishop killed for inciting public unrest and heresy. In the 12th century, the Kistani king engaged the Archbishopric of Rabascall-Bergendia at first as a mercenary navy, but then as loyal subjects for 300 years. Kistan's much larger land army guaranteed that the Kingdom of Ultmar and the Kingdom of Culfra, who had long sought to rid all of northern Levantia of Latinic influence, would not rid the island of the Bergendii. WIP Kistan enters, recognizes the principality of Burgundie, offers protection to the BergesMenn from the Kuhlfrosi King Douglas Macrae I 'The Builder', maintain their nordic culture, garrison troops on the island. In return the BergesMenn become the navy and merchant marine of Kistan, providing ships and sailors. Period characterized by mutual respect. As the Kuhlfrosi empire expands and fortifies the coast of northern levantia, it becomes harder and harder to maintain the supply lines and political relationship between Kistan and Burgundie. 1367- Eratzi legislation creating Vineyard Origin Accredidation and specifically defining the Burgundie Wine Region. In the late 1300s and early 1400s Kuhlfros, frustrated with the constant Kistani naval presence off of his coast mounts a series of raids and finally an invasion force into Burgundie to end the threat. Much witch hunts and trials here. Also Alchemy and other "learned" Kuhlfrosi stuff. Wars against Ultmar and Kistan. More of an early enlightenment than a true "renaissance". Just a few more witch things but at least they get trials...so democratization of justice? Introduction of coffee/tea leading to an end of a 1500 year hangover. Interaction with Muslim/Audonian scholarship. Wealth from colonisation creates a middle class. Colonization creates an outlet for none primary sons reducing crime, poverty, and mediaeval homelessness. Following the Northern Levantine Mediatization War from 1811-1837, Burgundie emerged from the Kuhlfros as an independent nation. 1826-1864 A rapid period of urbanization and industrialization followed the independence of Burgundie, which brought many new resources cheaply into the grasp of the common Burgundians. This economic choice and freedom was a spark that soon turned into a roaring inferno. The desire for these new goods led to the rebuilding of the Burgundian merchant fleet. Great Prince Pau II, patched relations with the Kistani and they bankrolled many of the upgrades to the shipyards and markets. The Kistani encouraged loans for companies that favored industrialized processes over craft production. This saw larger chantiers eclipsing smaller ateliers and forever changing the economy in Burgundie. Whereas before the Burgundian economy was a rats nest of related by independent workshops and guilds run by master craftsmen all coming together project by project, the Kistani investment forced a movement to massive companies with "in-house" processes and a large unskilled mechanized workforce. With this massive, immediate need for cheap labor the Isle of Burgundie turned to "the provinces". Many in the northern Levantine provinces of Marialanus, Argenbagne, and Burdeboch immigrated to the Isle of Burgundie in search of work. The population of Burgundie had doubled with the acquisition of new lands, but the majority of the population was, or soon moved to cities on the Isle of Burgundie itself. Almost immediately a social divide emerged. The people from the Isle of Burgundie saw themselves as superior to those native to "the provinces". Riots broke out against les æleigens (Eng. the aliens) in the 1840s which saw widespread support at first, but as business owners began to see the rate of absenteeism rise in the new working class, the government interceded on the owners behalf and stationed the Elite Gendarmes of the Royal Guard in immigrant neighborhoods to protect them. Since then the royal government has enjoyed a fairly positive relatioship with the working class. An uneasy symbiosis was established that was marked by a divide between the resource-poor but cash-rich urban Burgundians the resource-rich but cash-poor rural peoples of mainland Levantia. It was a time of infectious optimism and patriotic pride. With a sense of stability returned, the trade routes started spreading further than they had ever spread before. Shipping technology allowed travel to all of the continents, and in 1826 the first global circumnavigation by a Burgundian was completed. Having focused primarily on local trade, the expansion of global trade took some adjustment. Larger ships with deeper drafts lead to innovations in harbor dredging but took a toll on the dwindling cedar forests across the island. In the early 1820s a devastating bark beetle blight that almost eliminated the remaining forests on the Isle of Burgundie. Desperate for more wood as the demand from timber-producing areas outstripped the locals ability to harvest it, some enterprising NordHallish shipwrights contracted the Burgundian North Levantine Trading Company (BNLTC) to occupy the timber camps of the Kiravian island of Wintergen. The timber operations there were well established and those in the newly conquered provinces of Levantine Burgundie were under formed at the mainland wood was considered subpar. The government of Burgundie offered compensation but Kiravia did not accept terms and set up a government-in-exile. The status of Wintergen remains unsolved between the two nations. As the reach and influence of the Merchant Marine of Burgundie increased they started to incur the wrath of existing trading powers. Kiravia in particular, with its vast colonial and trading network, saw the resurgence of a powerful maritime Burgundie as problematic. Following the 1823 occupation of the Kiravian island of Wintergen, a tension began to grow between Kiravian and Burgundian merchant sailors until war was tacitly declared on both sides resulting in a delayed start to the Kiro-Burgundian Wars. This time period coincided with the Punthite Quasi-Wars where Burgundian and Kiravian ships started to engage each other in earnest. This erupted with the practice of "clipper baiting" wherein Kiravian ships would capture Bugundian ships and their cargoes. After suffering humiliating defeats for years at the hands of the Kiravians the Burgundian navy and the shipwrights of Burgundie focused its efforts on building smaller and faster ships, primarily on schooner rigged yachts. These ships, while incredibly fast, housed only three guns and could not engage the Kiravian sloops-of-war in direct combat. Both Kiravia and Burgundie endorsed prize courts in their ports. The era known colloquially as Le Talosocrasie (Eng. Trade Route Empire) spanned from 1837-1904 and is primarily a reference to the economic format of the time. It differentiated from the Trade Company Empires because trade became a centralized activity of the government. The government purchased majority portions of the various trade companies and directed their policy. This was a direct response to the escalation of the Kiro-Burgundian Wars, which at the time the Burgundians were losing badly. In addition to the international strife, the era was punctuated by internal violence as well. Constant uprisings across the newly acquired lands in Levantine Burgundie led many to abandon any hopes of investing and improving the area. To support the constant policing and military actions, taxes were raised, primarily against the poorer classes. It was assumed that since the majority of those caught rebelling were unskilled laborers or tenant farmers that the tax burden should fall on those classes. If it was observed that these cantankerous actions were organized and led by members of the Ultmarian lesser nobility and the middle class, it was ignored and no evidence of it exists in court documents. The pseudo-war sparked a ship design frenzy in Burgundie. Faster and sleeker merchant ships were needed to outrun the Kiravian navy. In 1832, the architects of the Doppel Shipyard produced a clipper ship that quickly became the standard of most Burgundian merchant fleets. The ship was unique because it had much more topsail yardage and any previous ship and was comparatively small. This allowed the clipper to achieve incredible speeds. These ships were designed to outpace the Kiravian navy and make the Yytuskia Beef Run in less than 130 days. This was important because even salted the beef would start to rot after the 135-day mark. Yytuskian beef was prized among the elite because it represented the extent of the Trade Route Empire's reach. The Yytuskia Beef Run consisted of travel down the Kistani and Urcean coast, across northern Ixprop, criss-crossing the Kindreds Sea, then shooting out from Vahltunskh to Yytuskia. The return leg saw the clippers travel to Akai, along southern Crona then back to Burgundie. Later, in the 1860s, Doppel Shipyard built extreme clippers to go down the eastern coast of Levantia, over the Levantine Ocean to Santheres and Pukhtunkhwa on the Spice Run. In addition to spices, some enterprising clipper captains started smuggling Pukhtunkhwan heroin in their holds. They would sell the heroin to black markets in Heku and Kiravia. These clipper crews became incredibly rich and would often flaunt their new found wealth upon their return. This drew the ire of the Catholic elite and soon the Revenue Guard was tasked with drug enforcement. Since no heroin touched Levantine soil, they needed a forward operating base. These trade routes were plagued by piracy. Additional issues arose around 1867 when the first record of "clipper baiting" was recorded. Laden with spices (and sometimes heroin) rival Burgundian and Kiravian clipper ships would lure each other into a pirate-infested territory. The slower of the two would be captured. The pirates would ransom the goods at less than market value to the faster ship. This led to a cutthroat business between clipper captains and Pukhtunkhwan pirate lords. The rash of piracy from Kandara and Pukhtunkhwa and "clipper baiting" spurred the predominantly Catholic Revenue Guard to set up a permanent base on the island of AyerSee and Sodermark in the 1870s. The AyerSee base of operations remains one of the foremost pirate hunting training schools in Greater Ixnay. While this run did at times include trips to Vespia there was often contentious competition with the Vespian Merchant Navy. The People's Spring of 1848 rocked the nascent establishment to its core. The socialist, anti-monarchist rebellions seeking independent republics of Burgundie, Ultmar and Flordeterra. The wedding of Great Prince Pau II in January of 1848 was so opulent and extravagant that it starved and impoverished many of the poor across Burgundie. Grain stores were expropriated, taxes were raised even further, and many workers were pressed into service to throng the parade route. Unlike his martial and resourceful father Pau I, Pau II was raised to be gentil and refined by his mother Maria-Isabel de Martilles. He was spoiled and reactionary, often choosing to micromanage his problems, regardless of his ability to do so knowledgeably. He was set to become an absolute ruler and the pomp and circumstance that he demanded for his wedding demonstrated that fact. In the months after the wedding, the starving peasants across Burdeboch and Marves took up arms and raided government storehouses in search of food. The militias from the Isle of Burgundie and Marialanus, as well as the Gendarmes d'elite della Gaurdie Real (Elite Gendarmes of the Royal Guard) for the first time, were mobilized and violently suppressed the peasants. Between Burgundie, the United Pukhgundian Emirates, the Trucial States, and the Emirate of Kagazi. 1865-1871. The The Nine-Year Terror was a civil war in Kistan from January 10, 1953 to February 21, 1962 and resulted in a massive build-up of the Army of Burgundie on the border with Kistan. It is ironically observed that the soldier's revolt in Kistan likely gave Burgundian soldiers enough work to prevent a similar revolt in Burgundie. Its more radical tenants also lead to the first Red Scare in Burgundie, which would reach a fever pitch during Operation Kipling. This build-up allowed the Burgundian arms industry to continue constructing at almost wartime levels to ensure that the Burgundian military was able to meet the new threats closer to home. This allowed for the older Great War equipment to be sold off to Audonian and South Punthite nations. The weary of constant wartime rationing, active duty, production quotas Levantine Burgundians also started to adopt a more hysterical view of world. With the Caphirian atomic bomb, the rise of Kiroocialism, and now the The Nine-Year Terror, many took to prepping. This was best exemplified in the bunker-mania of the 1950s and 60s in Levantine and Cronan Burgundie. Fallout shelters became popular both in public places and in the yards and gardens of those who could afford them. To govern this effort the Bureau of Emergency Defense was created and tasked with the generation of public preparedness material, conducting shelter inspection, and altering civilian populations of invasion or imminent atomic, later nuclear, strike. A cultural revolt of the modernist youth against the traditionalist establishment. The war ended with a modernist victory as the unpopular Great Prince August I abdicated in favor of his son August II, in 1975, and lead to the eventual collapse of the Marius Dynasty in 1989. Tenants of the mod lifestyle were often defined in opposition to the traditionalist standards of the day. Both styles persist, but the formal wear is relegated to high society functions, senior government officials, the royal family, and their attendants. 1976-present In 1976 the new Prince, Jörg II, embarked on a mission to reengage the world. Throughout the next decade he embarked on a goodwill tour conducted through Levantia and beyond. The tour was lauded for mending and strengthening relationships with Kuhlfros, Kistan, Urcea and Kiravia, and reasserting active Burgundian participation in the Holy Levantine Imperial Diet and Collegial Electorate. A resurgence in profile lead to an increase in trade and financial gain. Burgundian shipwrights again began to build world class ships, and the merchant class thrived on the new business. No longer were they just operating ships for trade to and from Burgundie, but Burgundian companies like O’Shea Container Shipping, Lansing Lines and Doppel Gangway became some of the premier merchant fleets in Greater Ixnay. In addition, new industries, particularly insurance and global maritime incident response/command, brought enormous gains to the labor market. Prince Kliebold III, set about a policy of deregulation, to attract additional businesses to Burgundie. Grasping the potential of the internet, Abs completely deregulated financial transactions conducted electronically. While this brought countless billions into Burgundian banks, it had the adverse effect of making Burgundie a haven for illegal or financial questionable accounts. Following the leaking of a report that the Revenue Guard was looking to seize thousands of accounts that they deemed illicit, many account holders pulled their money out of the Burgundian banking system. 2 in 5 banks failed. A national referendum on a bailout proposal was held and on Feb 9, 2005 the people chose not bailout the banks. Foreclosure signs became commonplace, particularly in the “Raugrafschaften” (undeveloped counties) where fewer people had contingency plans. The Golden Council of Ten enacted a 2 year no cost financial planning campaign for those who had lost more than 25% of their net worth. By 2006 the economy had begun to regrow and by 2008 the recession was declared over. Viceroy Abs’ deregulation policy was held responsible for the recession and his approval ratings have yet to recover. Burgundie generally pursues a policy of neutrality, with the exception of the obstruction of trade. A strong Navy of Burgundie, Airforce of Burgundie and Revenue Guard is maintained by the government, but can be supplemented, by Viceregal decree, by elements of the two private navies operated by the Maritime Response Group™ or Roth Insurance LLC. Since Burgundie is no longer a commodities exporter, almost all of the trade carried out by Burgundian merchant fleets is between other nations. Because of this Burgundie maintains a considerable trade deficit, but uses its diverse maritime revenue to keep the economy booming. Since 1996, there has been a huge investment in computing, light manufacturing and higher education which has helped to keep the unemployment rates at a steady 3%. Salaries are high, except in inland regions of the Raugrafschaften which is a manifestation of the cultural disparity between those born on the Burgundie and those born in the “Raugrafschaften” that continues to exist. However, the advent of social media is bringing the citizens of Burgundie closer all the time. This page was last edited on 27 December 2018, at 14:45.